Question: Is there enough room above the garage to create a bonus room? I'm not sure how I want to build it- whether garage on left or reversed. If I get the CAD files, will you let me call back and pay the reverse fee to get the reversed plans later? Answer: The bonus above the garage would have to be a modification. And yes, if you purchase CAD files and you realize you will need the reverse version, you would call in, pay the reverse fee, and we will email the reverse version CAD files to you. Answer: I am unsure what photo you are referring to. However, the plan can be modified to allow for a bonus room if desired. 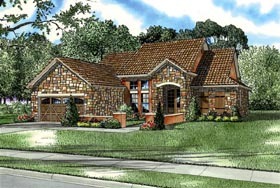 Thank you for your interest in our home plan design. The photos reflect the plans on site; the builder only removed the columns off the plan and replaced with laminate beams for a more open concept. The kitchen wall was reduced to have open space for the larger peninsula bar chosen by customer for the home.